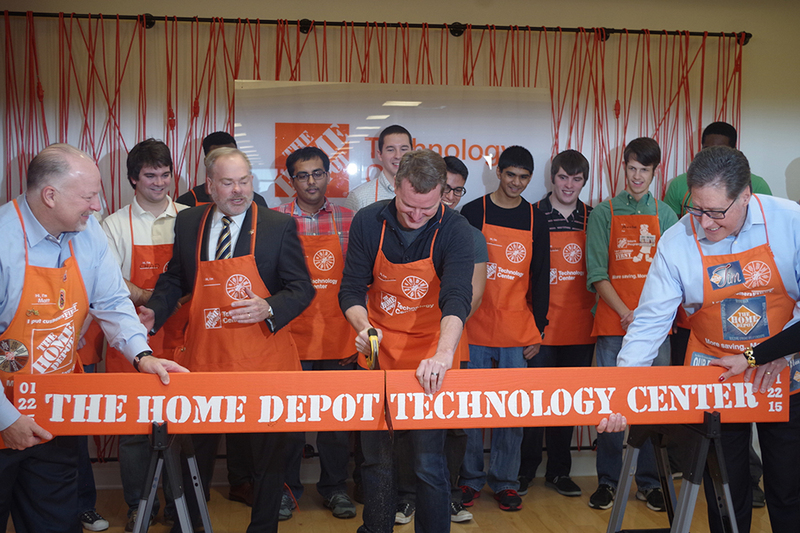 On Thursday, Jan. 22, Home Depot was officially welcomed to Tech Square with the opening of their Technology Center. Located on the eighth floor of the Centergy One building, the Home Depot Technology Center is the corporation’s first university-based research center. Home Depot started their summer internship program seven years ago and plans to employ students part time at the Tech Square location during the fall and spring semesters. They will also be assisted by full-time Home Depot employees, who they will collaborate with on projects that will bring new technology and strategic initiatives to Home Depot stores and warehouses. space,” said third-year CS major Preston Turner. With teams of students working alongside a full-time advisor, the floor is divided into circular team spaces to give the environment an open office feel while also maintaining a sense of individual privacy. Turner went on to describe plans they had for covering a majority of the wall space in whiteboard paint for the purpose of further streamlining the creative process. The Home Depot partnership adds another opportunity for Tech students to become familiar with entrepreneurship and innovation before joining the workforce. “This partnership is about co-innovation to create new opportunities and to solve problems which in turn help establish enhanced market competitiveness,” said Dr. Stephen Cross, Tech’s Executive Vice President for Research. According to Cross, the Center will benefit students by providing them with new opportunities to increase their experience in areas including Capstone Design and the Convergence Challenge. As the newest member of a growing group of corporations with locations in Tech Square, Home Depot hopes to make innovation and collaboration the keys to their success. “Home Depot would like to engage startups downstairs to integrate ourselves into the Tech Square community,” said Martin Key, the director of the Technology Center, during the opening ceremony. Tech President G.P. “Bud” Peterson arrived later at the event. Peterson was upbeat and optimistic about the partnership between Tech Square, and The Home Depot. “We are excited in welcoming Home Depot to the Tech Square community and we look forward to working with you,” Peterson said. The Home Depot Technology Center joins AT&T Mobility, Panasonic and ThyssenKrupp in Tech Square, which was named “2014 Outstanding Research Park” by the Association of University Research Parks.